Belmont falls short to Duke 72-58 in Stegeman Coliseum in Athens, GA March 17, 2018. The Office of Communications (OC) traveled with Belmont’s Women’s Basketball team to Athens, Georgia for the first round of the NCAA Tournament where the Bruins took on the Duke University Blue Devils on Saturday, March 17. Seeking to learn more about the team, Head Coach Bart Brooks and the overall program, the OC members spent nearly 60 hours at the big dance. He’s calm, cool and collected – a dad of sorts. He’s a “big picture guy,” at least according to a handful of folks closely involved with Belmont’s women’s basketball team. Coach Bart Brooks has only been a Bruin for less than a year, but according to his team and staffers, he’s a natural fit. He’s a family man – that can be seen by the way his sons, 3-year-old Trey and 10-month-old Tyler and his wife Charleen, known to all players as “Char,” are three more members of the Belmont team. It’s a family affair – open to everyone, even a no-athletic-skill communications professional who’s along for the ride. It’s apparent when the bus pulls up to Bill and Stephanie Holby’s house for dinner along the route. As Assistant Coach Jamey Givens’s in-laws, and avid Belmont supporters, the Holbys are a natural part of the team’s family, and their hospitality is evident. Stephanie stands in her light-filled sunroom, greeting each player with a hug and the happiest of smiles. Many faces she recognizes – they’ve filled her iPad over the last two years while she’s cheered Belmont to countless victories from her Buckhead, Georgia home. Before dinner, homemade by the Holbys, Bill gathers the team outside for a blessing. He congratulates the women on their recent OVC Championship victory, overviewing the game’s nail-biting end and their ability to close a 6-point gap in only 12 seconds. Back on the bus, the family spirit of this team extends beyond those who wear the blue and red. 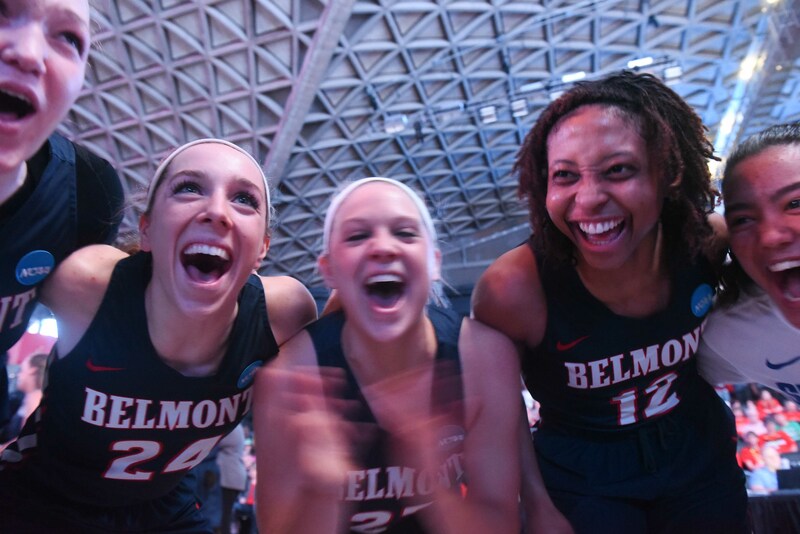 Belmont senior and guard Kylee Smith is especially excited about playing Duke this year – because one of her ‘family’ members, her childhood best friend Lexie Brown, is the team’s point guard and highest scorer. Growing up playing AAU ball together, Kylee and Lexie both transferred to their current schools and are playing as 5th year students, looking to lead their teams to an NCAA victory. Kylee’s willingness to open her ‘basketball’ family beyond her Bruins teammates extends past her friendly rivalry with Brown. In fact, a quick scan of the stands at any basketball game – home or away – will find father and daughter pair Glenn and Lynlea Payne, two more members of Kylee’s, and the Bruins’, family. Originally Vanderbilt fans, the Paynes became Bruins themselves when Kylee transferred from Vandy in 2014 and joined Belmont’s team. Her first year on campus, Kylee was red-shirted when Belmont played Vanderbilt at Memorial Gym. Kylee and Lynlea share a hug upon Lynlea’s arrival in Athens. Glenn realized Kylee was now a Bruin, and she invited him to the Curb for a game. The rest is history. Now, Glenn and Lynlea are staples at home games and even travel to away games, including the first round game against Duke. They’re members of the Belmont family, and though they joined the ranks because they followed Kylee there, she knows they’re fans for the long haul. Despite their love for each other and the people around them, there’s no denying the natural talent that is evident with this team. After a later breakfast call on Friday morning, the team fills the bus and leaves the hotel for the University of Georgia’s Stegeman Coliseum where they’ll meet Duke the next day. Before taking the court for pre-game practice, Coach Bart and three Bruins find their seats before a group of journalists for the day’s press conference. Kylee Smith, Sally McCabe & Darby Maggard participate in Friday’s press conference. Belmont junior and team guard Darby Maggard, senior and now all-time Bruins record holder for the most blocks during a season Sally McCabe and senior guard Kylee Smith take the stage with Coach Bart for Friday’s conference. The trio speaks about their winning season, last year’s trip to the NCAA tournament and their strategy for playing Duke. After the women leave, Coach speaks about his gratitude to those Bruins – and the others who make up the team – for the way they immediately accepted him into their family. It’s practice time, now – the women hit the court. Shooting drills, buzzer beaters, zone offense practice – this family is focused. But a sense of consistent encouragement, pride and a dedication to each other is clear. Shouts of “Good job, blue!” “Nice shot, Ky!” “Yes, Hannah. YES!” “Ellie, Ellie, Ellie!” fill the court. Practice ends with one final shot, the buzzer sounds and it’s back to the bus for one last afternoon and evening before tomorrow’s game. After watching a quick highlight reel, the team is ready to load the bus, and the hotel’s lobby is packed with cheerleaders, players’ parents, the pep band, students who traveled by bus to watch the game in person, Belmont administrators and more. As the players run through a tunnel of cheers, the fight song echoes in the background. It’s game day. The locker room is buzzing with activity – music plays loudly as the women prepare for the day’s challenge. Darby finds her way to the court before her teammates to shoot with Coach Givens. She makes nearly every single shot she takes. The rest of the team rushes the court in their “Splashville” branded shooting shirts, and Belmont fans fill the arena. With minutes left before the game begins, the team heads back to the locker room for one final word from Coach. His messages are clear – between strategies related to Duke’s offense and reminders for successful defense, he is quick to give a nod, many nods, to one of this team’s main strengths – their ability to play as a unit, a family. “Play free, play fast and always, play together,” he says. Senior Sally McCabe’s prayer is one of the last things the Bruins hear before they storm the court for their first round game. “Help us to play together as one unit, with the goal to glorify you,” she prays. Finding themselves again with a well-deserved place in the March Madness bracket, Belmont’s women’s basketball team played a hard, well-fought game against Duke University. At halftime, the Bruins take the locker room with Duke up by only 1 point. But Duke’s defense presented a significant challenge for the Bruins, and they were unable to pull out a victory with a final score of 58-72. Even despite a tough loss and the emotions that come alongside it, the team’s sense of family is present. As the women prepare to leave the crowded locker room, it’s time for one last huddle.